The End Of The Road ... | Life, The Universe and ... Everything! "A Samsung Malaysia representative has stated that all pre-order customers will be contacted personally to address the situation. A call to the Samsung Premium Careline also revealed that the company may share more details on its Facebook page. 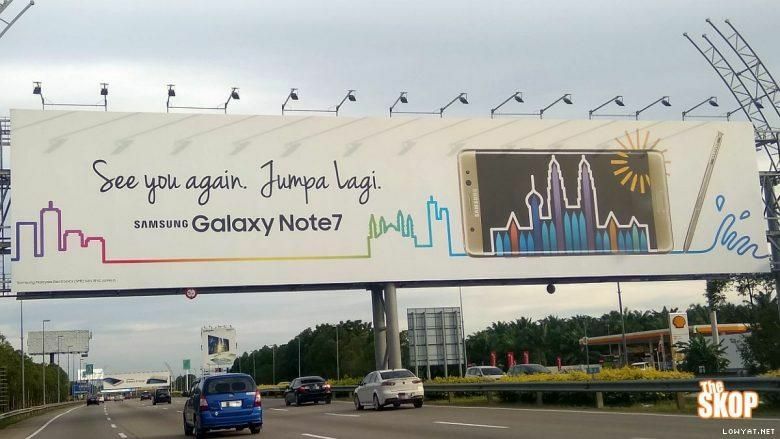 However, given that the device was never actually launched in Malaysia, Samsung may choose to be more discreet and personally get in touch with all pre order owners. In the meantime, both the representative and Careline operator urged all Note7 owners to power down their devices and stop using them." Darn ... this means another trip to MAXIS to get a micro-sim card. For a device I wasn't sure I needed, the Note 7 turned out to be a welcome surprise. Except for it's one fatal flaw, I ended up loving almost everything about it. The solid feel of the phone in your hand, where every part of it felt like it belonged exactly in place, with no creaky plastic in sight at all. It was totally snappy and fast ... certainly the fastest android device I have. And that gorgeous beyond-retina screen! Heck I even stuck with the TouchWiz and new Grace UI for a change as it looked very clean and tidy. The fast wired and wireless charging was amazing too ... being low on battery stopped becoming an issue when your top-offs are only 20-30 minutes long. I probably would never dunk it underwater but at least had no qualms leaving it on the table next to drinks at the mamak stall. I'm assuming that when they call, the Samsung rep will offer any other Galaxy Phone before finally agreeing to a full cash refund. I'm hoping they'll let me keep the power bank and wireless charger (after all they're not going to compensate me for the third-party stuff I've bought, which will be useless without the phone -- so these would make up for it in terms of value). For me, the S7 is too small, and the S7 Edge's edge is big distraction. I really want a Note spec'd setup ... so I guess I will have to just wait for the Note 8 next year. Given what Samsung has had to endure and the level of professionalism they've shown, they do deserve my money. But maybe only a few weeks after the Note 8 has gone on sale ... *grin* Meanwhile, please don't even bother to mention the iPhone 7 (just not interested) or Pixel (after the Note 7 the Pixel is just ... underwhelming). Meanwhile, it looks like my Note 3 needs some love and attention. I need to get a new battery (unfortunately "new" here could mean one that has been sitting on a shelf for 3 years and half depleted), and replace the camera module (mine has trouble focusing half the time). I've gotten use to wireless charging (even got a wireless charger for my car) so I might look into getting a wireless charging back cover for the Note 3. For it to work though the wireless charging rate needs to be at least enough to sustain GPS+3G+bluetooth+screen on. If it doesn't I probably have to buy a new car mount as I have chopped the existing car mount in two and glued it to the wireless charging system. btw: For what it's worth ... remember the first scare story that spread about the Note 7's gorilla glass screen being scratch prone and not much better than plastic? That one YouTube post went viral on a couple of hundred android websites and forums, spreading a great amount of Fear, Uncertainty and Doubt and not to mention a mad scramble for screen protectors. Even Corning, the maker of the glass, stepped in to clarify, but were met with jeers that it was yet another case of Corporation Lying or that there was a major cover up conspiracy at play. Well it turns out the guy who did the video has now admitted he screwed up the test -- he had sharpened his picks using a sharpening stone (which would need to be made of material harder than the highest grade of pick) and what happened was that bits of the stone got embedded in the pick, and it was that which caused the scratches. A retest with a new set of picks showed the Note 7 is comparable to other Gorilla Glass 5 phones. It just goes to show that managing public opinion is a major marketing challenge these days. 2016-10-16 Update: So it seems someone from Malaysia has also had their Note 7 catch fire, while driving on the highway no less. He publicly posted a rant blaming Samsung on Facebook, claiming that Samsung called him about returning the phone, but didn't explicitly tell him to power it off and stop using it. The post made it to a few local websites but had the opposite effect ... almost the entire nation labelled the guy an idiot ... I mean really ... it is hard to not know about the Note 7 and the risks of continuing to use it. They guy ended up deleting his facebook post, I guess hoping it would all go away. 2016-10-17 Update: I've yet to receive a call from Samsung, but I dropped off my Note 7 at the Samsung Store at The Curve this evening. Kept my free gifts (the power bank and wireless charger + power supply) and the shop guy also let me keep the power supply from the Note 7 box. Gave my bank details and IC, and they'll bank in the full amount I paid within 7 days.